Spain colonized Antigua Guatemala in the early 1500’s, building churches and convents in the shadow of three volcanoes. The Earthquake of 1773 reduced most of these structures to rubble, and though some were restored, the splendor of the remaining ruins seems to have a magnetic, and magical, effect. Tourists – even those from other areas of Guatemala – come here in droves. It’s not difficult to see why. Candy colored Spanish-style buildings line cobblestone streets composed of lava rocks rounded and scuffed by centuries of human, animal, and vehicular traffic. These streets – I must emphasize – wreak havoc on high healed shoes worn by an increasing number of brides who book destination weddings here. Have you been invited to one? Need ideas about what to do before and after the nuptials? Start with these – and don’t forget to pack sneakers or comfortable flat walking shoes. Antigua Guatemala is no place for stilettos. Wake up early and head outside with your camera. Early light enhances facades of powder blue, watermelon pink, canary yellows, and other vivid hues. Make sure to wander residential streets as well as the well-trod commercial grid. Lined with trees that bloom in the spring (beginning in late February), these neighborhoods are stunning at every hour. 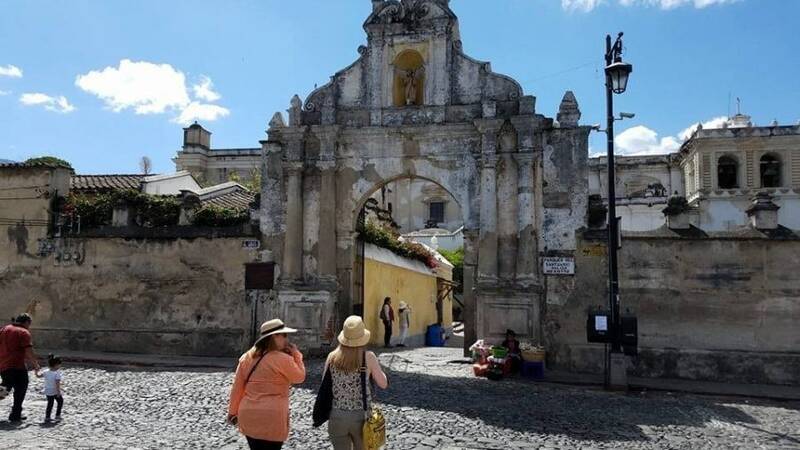 Shop the high-end stores and buy inexpensive baubles from street vendors on Antigua Guatemala’s 5th Ave – easily recognized by the yellow arch that spans what has become the city’s most photographed cobblestone street. The arch is actually a hidden overpass built in the 1600’s for nuns who had to walk from the Santa Catalina Convent to school without going out in public. Now, the archway serves as a landmark and meeting place. Check out the action at Parque Central – Antigua Guatemala’s version of Central Park – where tourists and locals mingle among handicraft hawkers and ice-cream vendors, and where water in the Mermaid Fountain spouts from the buxom breasts of comely stone ladies. Revel in ruins. Wander into churches, both abandoned and still operating. We happened upon the 50th Anniversary Wedding Vow Renewal of an elderly couple, accompanied by musicians and singer, and dozens of adoring family members. It was as sentimental and moving as you can imagine. Sample Guatemalan candy. Confections here are unique and lip smacking, with prodigious use of sweetened “leche” and meringue. Candy shops, sprinkled around town, are immaculate – and tempting. Eat Street Food. Grilled corn with lime and salt is one specialty – but you’ll find chicken with fresh tortillas as well. And, no, we didn’t get sick. Buy some art. This country’s hand-woven textiles are some of the best and most colorful on the planet (see Lake Atitlan), but also consider purchasing a pop-art-y vividly hued painting of villagers and Guatemala street scenes. Learn about jade, and perhaps purchase some. The ground in Guatemala coughs up “Jadite” jade (different from the “Nephrite” jade found in China), and locals love to educate the public about this semi-precious stone. It’s been documented that Mayans wore jade masks weighing 16 pounds, but you can purchase a fraction of that in colors white to light green, dark green to black (lavender being the most rare), in jade stores around town. Imagine cleaning your clothes in a stone sink at the communal washbasins in the middle of town. Guides call the area the “Facebook of Antigua Guatemala” – for all the gossip that flies on laundry day. Pick coffee beans, and learn about the process of making coffee from tree to cup, in a nearby Coffee Plantation. The 28 family coffee co-operative, De La Gente, offers personalized tours, the opportunity to pick beans, help husk them, roast, and grind them – all by hand. Afterwards, the host family serves a large lunch in a modest home, complete with coffee that will have you critically judging every cup you drink from then on. It is ambrosial. Our host was Virgilia Lopez, one of the first women to join the cooperative in 2010. Today she is one of the largest exporters in the group. She works hard in the fields and at home, and prides herself on earning her own income, and being able to send her children to school. Watch a volcano erupt. There are 33 volcanoes in Guatemala – with three still active. One, Fuego, is within view of town and often spews smoke (sometimes rock and fire as well) in dramatic eruptions. Locals shrug their shoulders – they are “used to it,” as they also are with frequent low-level earthquake rumblings – but it is definitely something that we foreigners might never see in our lifetimes, and transfixing as hell.